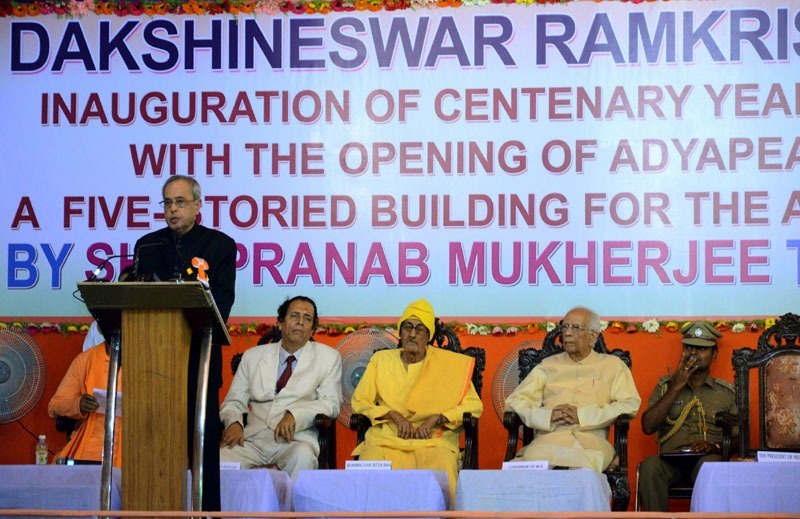 The President of India, Shri Pranab Mukherjee participated in the celebration of the 100th year of the advent of the Divine Adya Mata organized by Dakshineswar Ramakrishna Sangha Adyapeath at Kolkata yesterday (April 2, 2015). He also inaugurated AdyapeathAnnada B.Ed. College and an orphanage for boys on the occasion. Addressing the gathering, the President said he was pleased to see the numerous activities that have been taken up in the various centres of the Dakshineswar Ramakrishna Sangha Adyapeath - particularly the old age home, the home for widows, the charitable dispensary, the girls’ school, Sanskrit Mahavidhyalaya and Teacher Training Institute. The Adyapeath has never discriminated against any religion or caste or section of society. It is a symbol of communal harmony that has opened its doors to give local inhabitants medical treatment and spiritual succor.